I am overjoyed to share with you the incredible news this day has brought. Elizabeth is out of surgery and doing extremely well! Her surgeon told us that the surgery went better than expected and to quote him “far exceeded his expectations“!!! He said he was able to remove all visible tumors by removing her right lower lobe and mediastinal lymph nodes. Words simply can’t describe how incredibly grateful, happy and relieved we are. 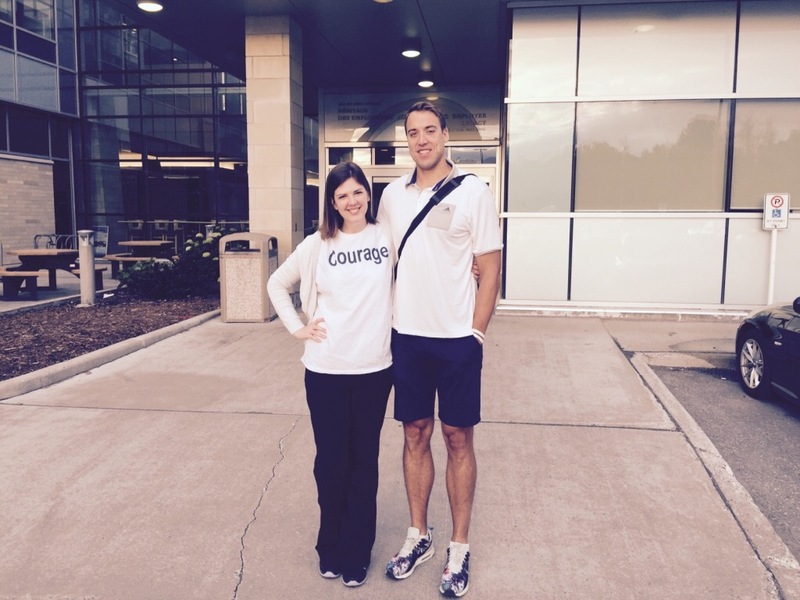 Elizabeth with Dax in her ‘Courage‘ shirt given to her by Chris Draft outside the Ottawa Hospital this morning. We were able to see her for the first time a few minutes ago. Her first words were “We did it!” She said “we” because she knows more than anyone how it took an army of supporters from her healthcare team, family, friends, colleagues, fellow cancer survivors and her community to get her where she is today. There were so many prayers said for her and so many messages sent. She may not have been able to respond to them all but she read every one. They gave her tremendous strength in the most difficult hours. There will be more tests, more treatments and more scans to come..that is the cancer journey. But with each little step and each little win, knowing we’re not alone keeps us going. And today was a HUGE step and we will keep going!!! 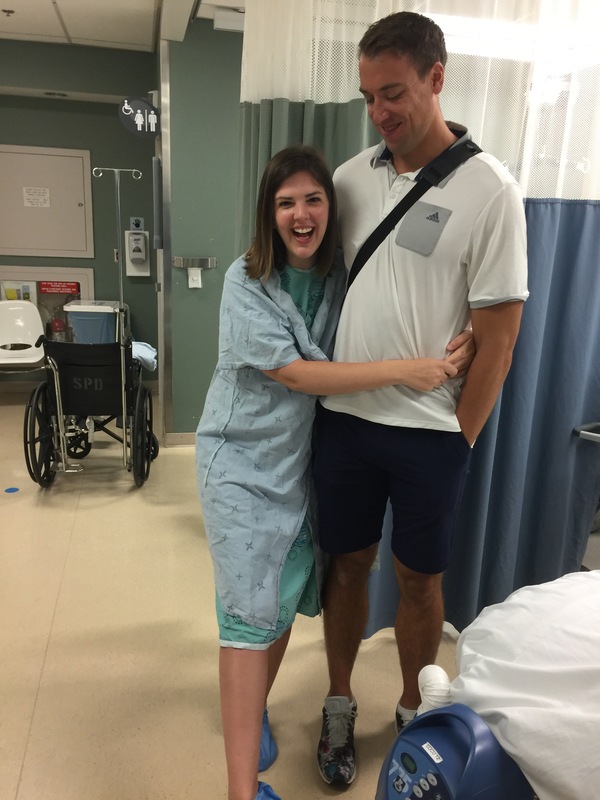 She was smiling right up until they wheeled her into the Operating Room. She reminded us not to be afraid that today was a “good day”. And it sure was! Iam just so happy to read this news !!! Wow ! Feeling elated in Fort Mac !! Keep going Elizabeth ! You will be back better than ever ! Awesome news. I will thank God in my prayers. Soooo happy for you and your family. Great news!!!! Here’s to a speedy recovery. Sending you good thoughts! Best news ever! Keep smiling! I don’t know you Lizzy but I know your journey. I’ve been living with stage III for almost five years and stage IV for three and a halv. Hang in there, the journey isn’t always smooth but you have so much to live for and you know it. What wonderful news. She said it would be a good day and it has been. What an inspiration you are. So courageous. So positive. So beautiful! So great to hear! Huge hugs to all of you xoxo! 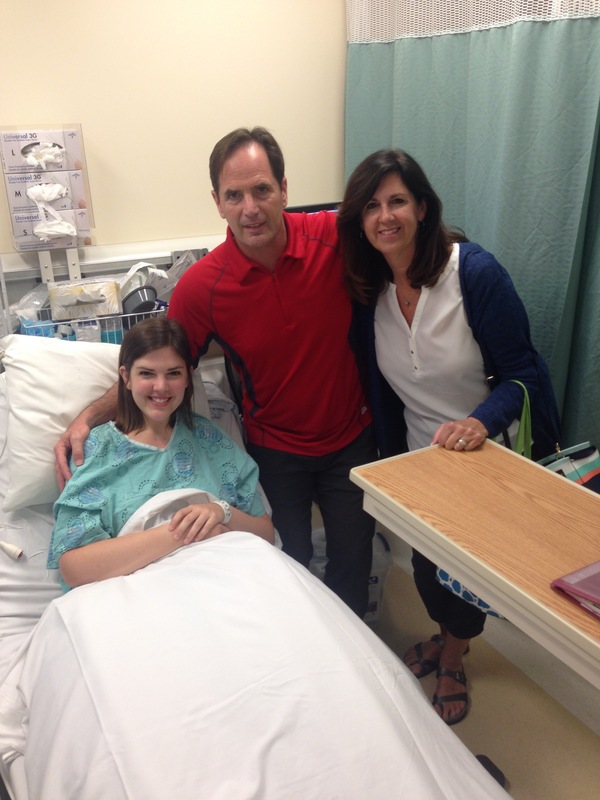 God & All of you have made Lizzie’s journey possible…such wonderful news! Wonderful news and prayers will continue for you and your whole family. I’m so touched that you are sharing you’re journey with us! Positive thoughts and prayers are always sent your way! Wow! Best news ever!! I am praying for the best recovery possible. Elizabeth is one amazing girl with a wonderful family behind her. Love to all. Wow! Now that’s some good news! Happy day! Great news Robyn! So happy for Elizabeth! What great news! June 28th, 2016 is another turning point in the journey that Elizabeth has embarked on with such aspiration, hope and positivity. Thanks for keeping us updated as we are all thinking about You. What wonderful news – you are all so inspiring to us – courage and hope surround you and this gift is THE BEST NEWS YET!!!! We pray each day and wear our “Just Breathe” bracelets thinking of you and spreading the good news!!! I just found your blog today through Lung Cancer Canada. Lizzie’s Mom – I’m delighted to hear Lizzie is doing so well. I send best wishes for a speedy recovery. I’ve been on the same journey for a few years (same cancer and surgery, just different targeted treatment). All the very best in recovery. I’m looking forward to purchasing a bracelet once you’re back at it! One thing I wondered from reading your blog – ever test your home (or perhaps one growing up in) for radon? It’s the second biggest killer of those with lung cancer and such an easy test for peace of mind. So many provinces’ health departments do a poor job of raising awareness. Great news! You are an inspiration! This is such amazing news! Wishing you a speedy recovery so you can get back to being with your family. Keep fighting; keep breathing. You got this! Most incredible news. Best team of Doctors. You are such a blessed inspiration to families fighting this battle. THANK YOU for your dedication to find a cure. Take Good Care.